On the opening night of Alvin Ailey American Dance Theater’s week-long engagement at Zellerbach Hall, both the Director of Cal Performances (Matías Tarnopolsky) and the Artistic Director of AAADT (Robert Battle) took the stage to offer some brief remarks and greet the packed house. Both men shared their regards for and belief in the deep partnership between Cal Performances and Alvin Ailey American Dance Theater. This unique relationship is one for the record books – a long-standing commitment from both organizations, founded on support, dialog, artistic excellence, community outreach and unforgettable performances. First on the bill was Kyle Abraham’s salute to jazz: 2012’s “Another Night”. A gorgeous ensemble work, this was a piece devoted to leg extensions and serpentine torsos, a challenge which the Ailey company can certainly take on. Abraham also included super-human tempo changes. One minute, the dancers were going eighty miles an hour, then they would stop abruptly and hold a still pose for some time. It was like watching biathletes. The biggest take away from Abraham’s energetic, crowd-pleasing composition is that, when it comes to dance and choreography, absolute perfection is not and should not be the goal. Art is about chance, risk, acumen and gumption. Jazz music has this and so does “Another Night”. The unison was not exact and the dancer’s interpretation of the choreography was divergent and personal. Structure was most definitely present while conformity was appropriately absent. 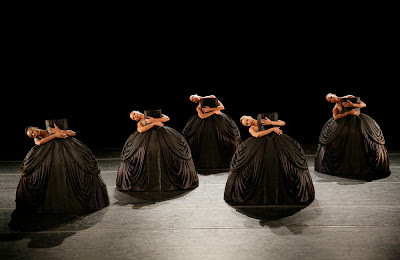 Company members of Alvin Ailey American Dance Theater perform "Petite Mort"
Act II began with Jirí Kylián’s “Petite Mort”; an artistic buffet of form and content. A renaissance piece in the sense that it has a little bit of everything, this short ballet does it all well. With a lack of accompaniment during the unison sword sequence, there is both vulnerability and aggression. Then we move to neo-classicism with the partnering section, as every movement marks moments in Mozart’s score. Kylián even infused a bit of humor as six rolling dresses come on the scene. Next came the first of Battle’s two works, “Strange Humors”, a duet danced by Renaldo Gardner and Michael Francis McBride. “Strange Humors” is a structural etude, featuring unison, canon and accumulation. Gardner and McBride were dynamic perfection as they embodied these different forms, which were all underscored by an unusually fabulous choreographic combination: tribal rhythms meet early 1980s disco. Battle’s “In/Side”, a solo danced by Samuel Lee Roberts, was completely intense. Toggling between staid and chaotic, one of Roberts’ early turns (which ended with a collapse to the ground) elicited audible gasps from the audience. Battle injected several B+ poses, which in the ballet world, is also referred to as ‘preparatory position’. It seemed calm and quiet, but with an undercurrent – something big was going to happen next. As always, the program closed with Alvin Ailey’s 1960 masterpiece suite, “Revelations”. A modern work that will live forever, the most important thing about “Revelations” is that it transcends time. It is not only a brilliant historic piece, but holds deep meaning and applicability for today. Though the finale “Rocka My Soul in the Bosom of Abraham” often steals the show, the two best sections are “Fix Me, Jesus” and “Sinner Man”. “Fix Me, Jesus” is one of the most beautiful duets I have seen, ever. Danced flawlessly on this opening night by Linda Celeste Sims and Glenn Allen Sims, the short vignette transports you to another place. And, Ms. Sims’ promenade in ecarté cannot go unmentioned.